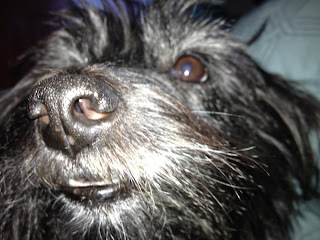 Just like our dog Ari (pictured here in the extreme close-up), I love peanut butter and oatmeal. So why not merge the two? This recipe is adapted from Vegan in Bellingham's with a few modifications. Preheat oven to 350. Combine the flour, oats, baking powder and salt in a bowl and mix well. In a stand mixer (or a large bowl with a handheld mixer), cream the shortening, sugars and vanilla. Mix in the almond milk. Slowly add the dry ingredients to the wet and mix well to form a cookie batter. Bake for 10-12 minutes, or until golden and crispy. If your oven is uneven, be sure to rotate the cookie sheets half way through the baking.